Whenever I mention chocolate mousse as a dessert option, especially white chocolate mousse, the response is usually "mmmm" or "ooo" or "aahhhhh"... It's so rich and velvety and smooth, no wonder it's been a favorite for decades in high end restaurants for years! It also happens to be very romantic if you'd like to make something for your special someone. The thing is, most people think it's difficult to make. Not true! It's actually very simple. You're basically making a custard and then folding whipped cream into it. How can anyone not love that? I'll just bet you'll score extra points if you make it for your special occasion. Topping it with fresh strawberries or blackberries or raspberries just makes everything perfect! Enjoy! Heat 1 cup whipping cream in 2-quart saucepan over medium heat just until hot. Gradually stir at least half of the cream into egg yolk mixture, then stir back into hot cream in saucepan. Cook over low heat about 5 minutes, stirring constantly, until mixture thickens (do not boil). Beat 1 1/2 cups whipping cream in chilled medium bowl with electric mixer on high speed until stiff. Fold refrigerated mixture into whipped cream. 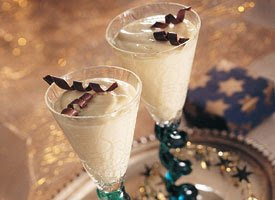 Spoon mixture into parfait or martini glasses. Garnish with chocolate curls or top with fresh berries. Store covered in refrigerator. semisweet chocolate chips instead of the white chips. The rest of the recipe remains the same. Oh, and one other thing... forgive me for not using my own picture...I'll get to it one of these days.. In the meantime, thank you to the folks at Betty Crocker for letting me borrow theirs!